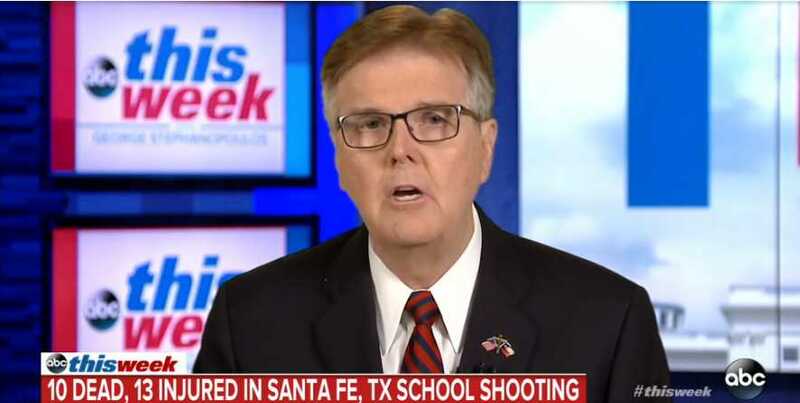 AUSTIN, Texas — On ABC’s “This Week” broadcast, the lieutenant governor of Texas lamented the “culture of violence” in America in speaking on the deadly high school shooting in Santa Fe that took the lives of ten people and wounded more than a dozen others. He said that young people are becoming desensitized to the violence through various forms of entertainment until they think nothing of it. “Psychologists and psychiatrists will tell you that students are desensitized to violence may have lost empathy for their victims by watching hours and hours of video violent games,” Patrick stated. When host George Stephanopoulos noted that Patrick had not mentioned any gun regulations in his statements, Patrick said that he believes gun control begins in the home, but also noted that the problem goes deeper: It begins in the heart. Stephanopoulos remarked that other developed nations, however, aren’t as violent despite the availability of violent video games and social media. He said that American students are 82 times more likely to die of gun violence than youth in other nations. Patrick reiterated that America is a nation full of violence, and it has come to the point now that even children are not safe to go to school. “Here’s what I know: We live in a violent country where we’ve devalued life. Kids go to schools that are not as safe as public and government buildings,” he said. “Look, you need all the fire exits you need. But, we should have eyes on students walking into our schools. This student walked in with a gun under a trench coat Friday and no one in law enforcement stopped him,” Patrick continued. Reports note that Santa Fe High School assailant Dimitrios Pagourtzis, 17, had posted a photo to social media weeks before the attack of a t-shirt that read “Born to Kill.” He also had utilized the album cover for the electronic and dark wave band Perturbator for his cover photo, a graphic that included a pentagram front and center. Reports state that Pagourtzis identified as an atheist and liked to listen to heavy metal music. During Sunday’s interview, Patrick said that he is not against gun control, but he believes that it starts at home and with background checks. As previously reported, Governor Matt Bevin of Kentucky made similar in January after a 15-year-old student at Marshall County High School opened fire on his peers, killing two and wounding more than a dozen others. As previously reported, in Mark 7:20-23 Jesus outlined that murder, like all sin, begins in the heart. It is why He declared that men must be born again (John 3:3) and have their very nature changed.